socks, originally uploaded by All Things Mimi. My first attempt at socks. It is not going well. It has taken forever to get this far. I ripped it out about 8 times, just trying to get the round joined on the double pointed needles. My rib pattern is also messed up, but I swear it would kill me to rip it out again! Part of the problem is the double points. 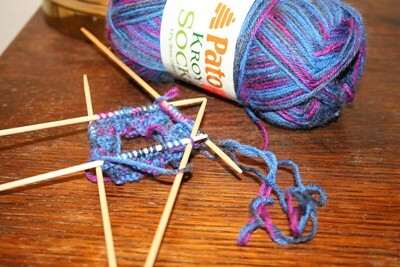 I am used to knitting on huge needles, so using size 3 needles is like knitting with toothpicks. And using so many needles at once is difficult, because I'm a spaz. okay so obviously I am reading your post in order and didn't see you already posted about the socks, ha ha. But, you can do it!!! I think I ripped out my first nearly completed socks three times, but now I enjoy making socks now and then - I'm not addicted by any means.